It's the great pumpkin, Sam Winchester. made 의해 me :). Images in the Castiel club tagged: supernatural season 4 it's the great pumpkin sam winchester castiel misha collins. 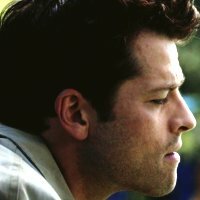 This Castiel icon contains 테니스 프로 and 프로 테니스 선수. There might also be 테니스 선수, 테니스 라켓, 초상화, 얼굴, 근접 촬영, 얼굴 만, 세로, and 헤드샷.